There’s no such a thing as a typical day at Younghusband. Each day is a blank canvas with any number of diversity activities, creations and people finding inspiration in the woolstore. For six weeks, one could find RMIT students using masking tape to create shapes and patterns across the vast timber floors, already marked upon by previous occupants throughout its 100-year history. Younghusband has been the focus site for an RMIT Interior Design studio led by Ariel Aguilera and Andrea Benyi from Melbourne design practice Pandarosa. Students undertook a series of onsite exercises and engagements within the building, extracting a range of different design elements and principles found within the site. The studio aims to engage site through a simplified viewpoint; withdrawing existing graphic conditions from the built environment. The Pandarosa team says they chose Younghusband as it’s a 'shifting' site. That is to say, although its currently being used by a range of tenants across different fields, the fact that the various stages of the development are still being underway opens up opportunities about what the site 'can be'. “This is an interesting realm for students to operate in, as it allows them to consider diverse programming options towards their final site propositions,” Ariel said. The studies will aim to observe the site through a graphic eye, extracting it’s present graphic conditions and analysing their potential towards spatial practice and interior implementation. These investigations will not only allow the students to learn to explore alternative ways in which to visually communicate and represent interior conditions, but also influence the manner in which interior environments and experiences can be generated and assembled. “The response thus far has been great and we look forward seeing how ideas develop further as the studio proceeds,” Ariel said. 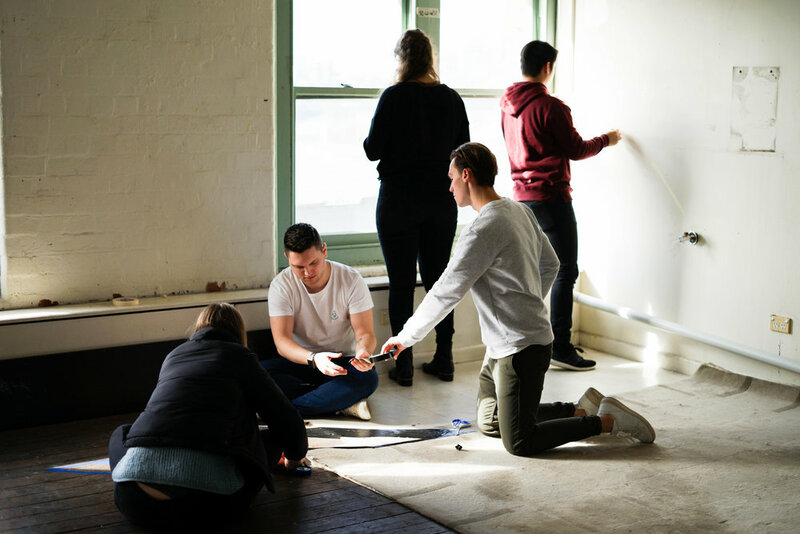 Younghusband was also recently host to a 5-day workshop run for RMIT Masters of Architecture students, exploring the capacity of old buildings to host new activities or unexpected possibilities.